The SI Ballistic Goggle is designed to present the best Oakley has to offer in protection, optical performance, and comfort. The SI Ballistic goggle is fully compliant with the ANSI787.1 - 2003 for both protection (high mass/velocity impact and penetration) and optical performance requirements. The SI Ballistic goggle lenses are made from Oakley's high purity, optica grade polycarbonate, Plutonite® (blocks 100% UVA, UVB, and UVC light). The SI Balistic Goggle is equipped with a micro-fleece face-foam liner to provide a secure and comfortable fit for all sized heads. Fully compatible with MICH, ACH, CVC, and PASGT helmets. 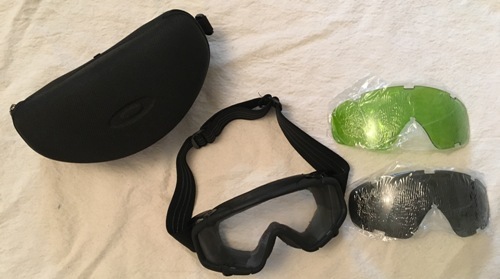 Used/Good condion goggle with two lenses and case - $50.00 & Free shipping! The goggle for sale here is brand new. We have two brand new sets currently, one with three lenses - colors: CLEAR, SMOKE,and YELLOW/GREEN . These goggles are for sale all over the internet with just ONE lense for $110. A few places have all 3 lenses for $169.95 and up Glenn is selling his 3 lense kits (shown in the last picture) for $99.95 & Free shipping! Grab yours while they last, just a few pairs available, once they are gone they are gone for good! !